This newsletter contains information about the national Choose Life specialty license plate efforts now being handled by Choose Life America, Inc. If you want information about the Florida Choose Life plate effort, go to www.flchoose-life.org. Follow us on Twitter @life_america. This page was last updated March 20, 2019. IMPORTANT NOTE: This newsletter contains information about the national Choose Life efforts now being handled by Choose Life America. For the Florida Choose Life license plate, go to www.flchoose-life.org. 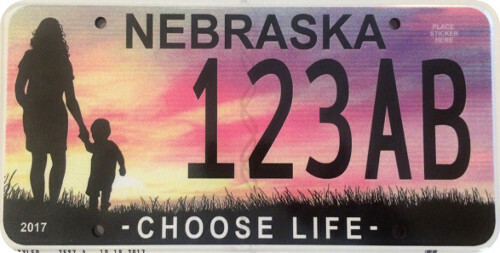 The Nebraska Choose Life license plate was approved in 2017. It is available at the Motor Vehicle Division. The plate will cost an extra $5. The money will go to services to help prevent child abuse. Special Offer for Florida Drivers Only! Choose Life, Inc. will give $50 to anyone who switches their vehicle license plate to a Florida Choose Life license plate and agrees to keep it for 5 years. All you need to do is go to your local license plate office with your current registration and proof of insurance and ask them to switch you to the Florida Choose Life license plate. Mail a copy of the receipt they give you to Choose Life America; PO Box 830152; Ocala, FL 34483. You will receive a check for $50 within 10 days. Each year thereafter, you will receive your normal license plate renewal letter from the County DMV and the $25 annual renewal fee for the Choose Life license plate will be added to your normal license plate renewal fee. Of the $25 the state & county share $5 and Choose Life, Inc. receives $20, of which they in turn distribute 85% to the life affirming Pregnancy Care Centers, Maternity Homes and non-profit adoption agencies in Florida and use 15% to advertise and administer the program. If you itemize your deductions on your Federal tax return, the $25 can be put on your return as a contribution. The Choose Life Plate sales have passed the $28 million mark nationally! The total reported Choose Life license plate sales/renewals nationally is 1,178,848 and they have raised over $28,343.289 as of 3-20-2019. Russ & Jill "On the road again!" May & June 2018: 8,470, nine states and five more states working on getting a Choose Life plate. The plates are now at the Probate Offices (DMVS) throughout the state. Go to www.chooselifeaz.org/plates for information on how to get the Choose Life plate for your vehicle. Alaska: Choose Life license plate went on sale May 2012, go to https://online.dmv.alaska.gov/dos/PersonalizedPlate/Personalizedplate for more information. Arizona: 9,982 sold/renewed from 5-5-2009 through 9-11-2018, raising 921,874. (State Cost $27 the first year and $25 annually thereafter, of which $17 goes to the Arizona Life Coalition to provide life-affirming hope and resources to the women, men and children of Arizona through truthful and loving education, services, and public policy.) For more information, go to: www.chooselifeaz.org/plates. Arkansas: 36,8758 sold/renewed from 8-29-2003 through 12-14-2017, raising $897,224. (State Cost $35/year of which $25 goes to the cause). Arkansas plates are now at the Motor Vehicles Offices throughout the state. Contact Rose Mimms Arkansas Right to Life (800) 714-2785 for more information or click here to learn how to switch to the new Arkansas Choose Life license plate. Connecticut: 3,268 sold/renewed through 12-14-2017, raising $65,356. (State DMV Cost: $65 one-time fee; Initial Membership Fee: $10; Yearly Membership Renewal Fee $25 with $20 going to support the cause). The Connecticut "Choose Life" license plate has been approved and is now available. To request an Application Form for the Connecticut "Choose Life" license plate, please contact The Children First Foundation toll-free at 1-877-386-3236 or via e-mail at info@thechildrenfirst.org. Return the Application Form directly to The Children First Foundation (P.O. Box 326 / Eastchester, NY 10709) along with a $10 check (payable to The Children First Foundation) for initial membership and a $65 check (payable to the CT DMV) for the actual plate. CFF's president will verify your membership, co-sign your application form, and send your application and $65 check to the Connecticut Department of Motor Vehicles. The DMV will mail CFF's Connecticut "Choose Life" license plate directly to you. The State of Connecticut requires that you must be a member of The Children First Foundation in order to have CFF's Connecticut "Choose Life" license plate on your car or truck. Your $25 yearly CFF membership renewal fee will support pro-life agencies in Connecticut that help women who choose life and adoption for unwanted pregnancies and newborns. For further information, please visit CFF's web site at www.fund-adoption.org. Delaware: 2,076 sold/renewed from 8-24-2010 through 12-14-2017, raising $41,250. (State cost $40, cause $20). For more information on how to get a plate, go to www.chooselifede.org or email Jim Cordie. District of Columbia: 68 sold/renewed from 10-23-2013 through 12-14-2017, raising $1,700. (State charges one-time fee of $100) Membership in The Children First Foundation is $25 annually and $20 is returned to the life affirming Pregnancy Centers and Safe Haven. For information on how to get the plate, go to: www.thechildrenfirst.org/washington_dc1.aspx. Go to your www.flhsmv.gov/locations/ with your registration and proof of insurance and ask them to switch you to the Choose Life license plate. Then email your name address, phone and the plate number to Russ Amerling and Choose Life America, Inc. will mail you a free Choose Life license plate frame, white with red letters, see plate frame at Product Store on this website. DMV official figures show the Choose Life plate in the #18 spot out of 145 plates on the road. Georgia 50,696 sold/renewed from 10-1-2007 thru 12-14-2017, raising $506,694. (State Cost $35 annually, of which $10 goes to the cause) The Choose Life license is now available at your local motor vehicles office. If you want more information about the Georgia Choose Life plates, go to www.chooselifega.org . The goal is to channel resources into front-life life-affirming agencies to increase the one to two percent of abortion vulnerable women choose adoption for their children. Hawaii: 3,306 sold/renewed from 7-16-2002 thru 12-14-2017, raising $66,126. (Cost $25 each year, of which $20 goes to the cause) For more information contact Garret Hashimoto at the Aloha Pregnancy Care & Counseling Center 808 234-7233 to learn how to get the Choose Life plate for your vehicle. The funds are shared with all three Pregnancy Centers in Hawaii.P.S. : The Hawaii "Choose Life" license plate is continuing to sell, but the Hawaii Planned Parenthood "Respect Choice" plate has died. There are only 3 left on vehicles in the state. Indiana: 29,773 sold/renewed from 1-1-2007 thru 12-14-2017, raising $744,325. (Cost $40 each year, of which $25 goes to the cause). Go to www.chooselifeindiana.com/ for information on how to get your plate. The Indiana Association of Pregnancy Centers will be distributing the funds raised to all members of the Indiana Association of Pregnancy Centers. Iowa: 1,500 sold/renewed from 6-10-2013 thru 12-14-2017, no funds raised by plate. Kentucky: 39,448 sold/renewed from 7-1-2005 thru 12-14-2017, raising $394,477. (Cost $25, cause $10) The plates first year cost is $28 and a $10 donation to go to the pregnancy centers in your county. The renewal is only $15, plus $10 be donated to the cause. After the first of the year, the $10 donation will be included in your renewal notices. Choose Life plates are available at the license plate offices across Kentucky. Go to www.kentuckyfamily.org/ for more information. The Louisiana Choose Life license plate is now on sale. Go to www.prolifelouisiana.org/resources/chooselifela.html for information on how to order your Louisiana Choose Life license plate. In order to be qualified to purchase a Choose Life license tag in Maryland, the following must take place. Applicant must be a member of Choose Life of Maryland, Inc. Annual membership dues are $ 15.00. There is a charge of $ 25.00 for the tags by the State of Maryland. This fee is to be sent to Choose Life of Maryland, Inc. along with the membership dues. Payment will be made to the MVA when the application is completed. Download and fill out MVA form. Mail form and check for $ 40.00, payable to Choose Life of Maryland. Inc. We will forward form with payment to the MVA. Tags, replacement stickers, and a new registration card are mailed directly to the members address. Members will mount the tags and return the original tags to the MVA. Please avoid covering the “CHOOSE LIFE” with tag frames. Note - registration of your vehicle with the State of Maryland is separate from obtaining “CHOOSE LIFE” tags. Registration should be current to expedite the process. For more information contact: Edward R. Reilly; Choose Life of Maryland, Inc.; PO Box 3803, Crofton, MD 21114; call them at (410) 841-3568 or email Sandy. Massachusetts: 16,182 sold/renewed 6-16-2010 through 12-14-2017, raising $468,462. (Cost $40, cause $28). For more information go to www.machoose-life.org. Mississippi: 138,054 sold/renewed from 7-1-2002 through 12-14-2017, raising $3,313,302. (State Cost $31/year, of which $24 goes to the cause). The Mississippi Choose Life plate is available through your local county tag office. You can now go into your local tag office to order your plate and it will be mailed to you. You can go to http://www.mschoose-life.org to see the plate or email Janet Thomas for more information on how to get the Choose Life plate for your vehicle. Missouri: 1,942 plates sold/renewed 1-1-2009 through 12-14-2017, raising $38,844 (Cost $25, cause $20). If you would like to purchase a Missouri Choose Life license plate go to: www.choose-life.org and click on the map of Missouri. Montana: 6,944 sold/renewed from 1-19-2004 through 12-14-2017, raising $138,873. NOTE! MONTANA RIGHT TO LIFE LOST IT'S STATE TAX EXEMPT STATUS AMD THUS LOST IT'S RIGHT TO RECEIVE PLATE FUNDS AND IT WAS CANCELLED. THEY HOPE TO RE-APPLY IN 2017 (Cost $20/year, of which $20 goes to the cause). P.S. : The Planned Parenthood plate in Montana called "Pro-Family, Pro-Choice" and approved in March 2004 has only sold 84, so we are outselling them 35 to 1. Get your Choose Life plate at your nearest county license location. Nebraska: The Choose Life license plate in Nebraska is available now. They will only cost $5. If you want to be one of the first to get this specialty plate, contact Bob Blank (402) 598-3928 or email Bob. New Jersey: 3,683 sold/renewed from 12-3-2010 through 12-14-2017, raising $73,662. (Cost $25, cause $25) The first year only cost is $50. For more information, contact Dr. Elizabeth Rex, or go to www.njchoose-life.org. North Carolina: 6,944 sold/renewed from11-1-2016 through 12-14-2017, raising $925,801. (Cost $25, cause $20). For more information, contact Bobbie Meyer. North Dakota: 241 sold/renewed from 9-1-2011 through 12-14-2017, raising $4,825. (Cost $25, cause $20). For more information, call Ken or Paul at (701) 258-3811. Ohio: 28,367 sold/renewed from 5-18-2005 thru 12-14-2017, raising $568,344. (Cost $30/year, of which $20 goes to the cause). The state has two choices of designs to select from. Contact Beth Sidel or go to www.ohchoose-life.org if you want to learn more about the Ohio Choose Life license plate. You can also order the plate online at the Ohio DMV website http://www.oplates.com.. Go to www.ohchoose-life.org for more information as the date approaches. The Oklahoma Choose Life plate has been approved and is now on the road. You can contact Lori Sowers for more information or go to www.okchoose-life.org for information on how to get the Oklahoma Choose Life plate for your vehicle. Pennsylvania: 1,430 sold/renewed from 2-1-2007 through 12-14-2017, raising $122,272. (State Cost $35/year, of which $20 goes to the cause)1-30-2017, raising $28,600. (State Cost $44 1st year only, and $20 yearly membership fee which goes to the cause. After the state recoups the cost of producing the plate, the remainder of the $44 one time fees will start going to the cause as well. Go to Pennsylvania Choose Life, Inc. and download the application information. P.S. : The Pennsylvania "Choose Life" license plate is continuing to outselling the Pennsylvania Planned Parenthood license plate 37 to 1. South Carolina: 3,987 sold/renewed from 11-1-2008 through 12-14-2017, raising $69,780(State cost $25/year, of which $15 goes to the cause). The plate can be purchased at local DMV offices. Interested persons should call their local DMV office before going in to assure the plates are in stock. Click here for locations. South Dakota: 505 sets sold/renewed 3-2-2003 through 12-14-2017, raising $12,618. (State Cost one time $10 fee & $50 to Planning Life for the maternity home). The South Dakota Choose Life License Plate program is now available to all drivers in South Dakota. First Step: Go to your local county court house and trade in your current license plates for organization plates. The organization plates are generic for all organizations so you do not need to request a specific organization. You will be charged a $10.00 fee when you exchange your current plates for organization plates. You will also be given new registration stickers at the same time, which is included in the $10.00 fee. If you have a new car to register, the State will not charge this additional $10.00 fee when you request the organization plates at time of registration. The State will charge you the normal fees for registering your vehicle however. Your court house will most likely not know who you should contact for the Choose Life decals. The cost for a set (two) of decals is $50.00, and 100% of the money raised will be used to help open and support CareNet Pregnancy Resource Center. Tennessee: 79,826 plates sold/renewed from 11-27-06 thru 12-14-2017 raising $1,246,888. (Cost $35, cause $15.62) The plates are available at local county clerk's offices. For more information, contact Tennessee Right to Life or call 1-877-CHOOSE LIFE. You can see the Tennessee Choose Life plate at www.choose-life.org, then click on Tennessee. Texas:.7,715 plates sold/renewed from 11-21-2011 through 12-14-2017, raising $169,728. (Cost $30, cause $22). For more information, go to www.txchoose-life.org. Virginia: 38,666 plates sold/renewed from 7-1-09 through 12-14-2017, raising $595,524. (Cost $25, cause $15). For more information, go to www.vachoose-life.org. Wisconsin: 102 plates sole/renewed from 10-23-2017 through 12-14-2017, raising $560. (Cost $25, cause $20). For more information go to ChooseLifeWI@gmail.com. Colorado: A team has been put together to work on the Colorado Choose Life plate. If you want to be a part of effort, please email it to Russ Amerling. Illinois A great team of pro-life supporters has come together to make the Choose Life license plate a reality in Illionis.They want 25,000 people who want the Choose Life license plate to sign up. If you want more information, email russ@choose-life.org. Maine: Choose Life Maine, Inc. has been formed and they are working to pre-sell the 2,000 plates needed to get the Choose Life plate into production, they already have about 700. Contact Russ for the latest informaiton or go to www.mechoose-life.org. It will have all the latest statistics and contact information for their organization. Michigan: Michigan Right to Life was successful in getting the legislature to approve the plate, but Gov Snyder vetoed it. He is termed out in 2018, hopefully the legislature will approve it again in 2019. If you want to help make the Choose Life license plate a reality in Michigan, email Russ. Nevada: We need 1,000 people who will purchase the Nevada Choose Life plate once approved. You can learn more and get a petition to gather signatures of prospective buyers . Email: Russ Amerling. Once the petitions are gathered, we will apply to the Department of Motor Vehicles to have the plate produced. Spread the word and get in on this historic effort in Nevada. New Hampshire: The Children First Foundation has started a chapter in New Hampshire and you will hear more about this in 2018. Email Russ if you want to know more. New Mexico: The Choose Life plate was approved in New Mexico, but the bill named it "Adopt a Child" and did not provide any funds. To buy the plate, click here. New York: US Supreme Court reversed lower court, now specialty plates are "state speech" not "free speech." Dr. Elizabeth Rex is working on an alternative plan, called half plate that may replace the old plan and still raise funds for the pregnancy centers. Stay tuned. Oregon: A non-profit organization has undertaken the effort to get a Choose Life license plate for Oregon. Russ & Jill Amerling Contact Russ if you want to be involved. Rhode Island: The Children First Foundation started a chapter in Rhode Island. They plan to try the half plate effort next year. Vermont: The Children First Foundation started a chapter in Vermont. Email Russ if you want to know more. Washington: Choose Life Washington, Inc. president Ben Hull is working with other officers and supporters to bring the Choose Life license plate to Washington. If you want to be involved in this process please go to www.wachoose-life.org or email Ben or Russ. Choose Life America, Inc. launched its totally new Product Store. You can get there through this web site by clicking Product Store on the homepage or go directly there at www.chooselifestore.org. All profits from this store go to support the efforts of Choose LifeAmerica, Inc. to get the Choose Life license plate approved in all 50 states. Non-profit pro-life groups are eligible to purchase all items at wholesale prices, email or call toll free 877 454-1203 for a wholesale price list. All the funds raised by the real Choose Life license plates go to the Pregnancy Care Centers, Maternity Homes and non-profit adoption agencies in the state where they are sold. Choose Life America does not receive any of those funds. Therefore we are funded primarily by the donation of folks like you and the Choose Life license plate promotional items. Please see our “Product Store” page on our web site at: www.choose-life.org and also visit our Donate page. Please help us raise the funds needed to carry this effort nationally . PLEASE NOTE! If you are involved in a non-profit, pro-adoption/life group, they are eligible to purchase all our promotional items wholesale and sell them retail and keep the profits to support their work. Have a representative from the organization contact me for details and a Wholesale Price List. The 2000 census showed Florida population at 16,396,515 and Mississippi's at 2,858,029. Florida’s average plate revenue is $70,000 per month and Mississippi 's average is $19,080. This shows Mississippi is out selling the Florida Choose Life plate by 56% per capita. Russ & Jill Amerling were presented with Heartbeat International's "Servant Leader" Award at their annual conference in Orlando, FL. We have many new products we are offering you to encourage your donations. Choose Life ties, scarves, sweatshirts, golf shirts, ball caps, promotional tags for the front of your vehicle, license plate frames & Choose Life stickers for your correspondence. These donations and profits provide 100% of the funds needed to keep Choose Life America, Inc. working to spread the Choose Life plate across this great country. Please forward this newsletter page to anyone you think might be interested. Just click the "Send this Page to a Friend" This whole effort has been done by grass-roots folks like you. We are available for any type of interview, just let us know. Contact Us now to receive our email updates on the progress of the Choose Life license plate efforts across America to get Choose Life license plates for all states. Want The Choose Life Tag In Your State? We are now working with groups and individuals in 19 states to help them promote or get the Choose Life license plate for their state. If you want to see these smiling-faced children on a Choose Life license plate in your state, see the Other States page for the organization working for a Choose Life tag in your state. If your state is not listed, contact us and we will give you free help and let you know how to make it happen. Want To Be Notified When The Tag Is Available In Your State? Want to be notified of efforts in your state to get the Choose Life license plate? Contact us requesting notification and we will let you know by email when a Choose Life license plate effort is started in your state. You can also check our "Other States" web page to see if your state is listed. A Federal Appeals Court ruling on a suit filed in January 2002, refused to halt the Florida Choose Life license plate and gave a brief High School Civics lesson to the plaintiffs. Since the opponents to the Florida Choose Life plate had never applied for a plate of their own, the Appeals Court stated, There have been three suits against the Choose Life license plate in Florida and all have been unsuccessful. The U.S. 11th Circuit Appeals Court ruled, “The first amendment does not require states to authorize the speech of those who have expressed no interest in speaking; it only protects the rights of those who wish to speak. ”The court further upbraided the plaintiff in its opinion saying, “Appellants were counseled in a previous incarnation of this case to apply for a specialty license plate before bringing a First Amendment challenge to Fla Stat 320.08058(30). Hildreth v. Dickenson No. 99-583-CIV-J-21-A, slip op. at 1 (M.D.Fla Dec 22, 1999). Rather than appealing the District Court’s admonition, Appellants chose to try again in this case.” This is a significant ruling as it establishes, at least in the U.S. 11th Circuit that states with reasonable application processes are not discriminating when the opposition does not use that process to apply for a plate and they cannot claim standing in court unless the do. The Automobile License Plate Collectors Association (ALPCA) nominated the Choose Life license plate as one of the top 10 new plates released in 2000. What an honor to be in the top ten out of 55 eligible jurisdictions. First and second place went to Wyoming and the U.S. Virgin Islands. The late Dr. D. James Kennedy of Coral Ridge Presbyterian Church issued the 2003 Reclaiming America Salt & Light Award to Randy Harris, President and Russ & Jill Amerling Publicity Coordinators of Choose Life America, Inc. for the best example of grass roots activism. We want to thank each of you who have worked so hard to make this a reality. This is your award too. We are blessed to be involved in such a wonderful work and to have the chance to get to know all you great folks!